When you choose a Victory Gable system you are choosing the most versatile system available in Adelaide, Melbourne or Perth (but probably the world!). 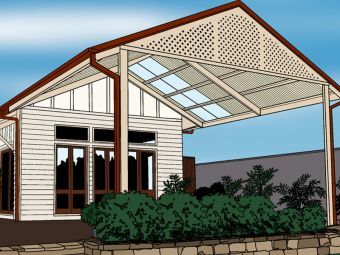 Displaying a strong presence and feel, the pitched roof of a Victory Gable Verandah, Patio or Carport creates a unique look and feel of spaciousness plus warmth that will enrich your home and outdoor entertainment area. We can custom design your gable to suit the functionality, size and shape of your area perfectly, adding finishing touches to make sure it adds style and value to your home. Victory Gable Carports are made from 100% Australian Colorbond® steel, that will be backed by an exclusive 30 Year Homeowner Warranty. They’re also engineered to stand up to Australian weather conditions.